Writings: Did Biosecurity Queensland managers write their own fire ant program review? It’s hard not to believe that they didn’t. Biosecurity Queensland has spent about $400m of public money trying to eradicate a fire ant infestation that is now ten times what it was in 2002. In 2015, the Australian Agricultural Ministers’ Forum commissioned a fifth independent scientific review of the National Red Imported Fire Ant Eradication Program. The review panel, ably supported by Biosecurity Queensland managers and contracted researchers, reported in 2016 that fire ants have not been eradicated so far was because of funding uncertainties: not poor science or incompetent management. The review panel recommended the Commonwealth government provides another $380m for a ten-year program to continue the same program and the same jobs that have failed so far; with less strings attached. We have to hope that the Commonwealth government continues to fund a fire ant eradication program. But the Commonwealth will be throwing good money after bad if Biosecurity Queensland continues to runs the program and if the Commonwealth does not provide proper oversight of the program. All reports and reviews of this publicly funded program should be available to the public to scrutinise how money is being spent in the public interest. Biosecurity Queensland has spent about $400m of public money trying to eradicate a fire ant infestation that is now ten times what it was in 2002. In 2015, the Australian Agricultural Ministers’ Forum commissioned a fifth independent scientific review of the National Red Imported Fire Ant Eradication Program. The Ministers wanted to know if, after fifteen years, Biosecurity Queensland managers had finally determined the extent of the fire ant infestation in south-east Queensland and what should be the future direction of the program: should it continue trying to eradicate fire ants, something no other country in the world has achieved, or was it too late for that now and the best option is to contain and manage a well-established infestation? The fifth independent review panel submitted its report to the Agricultural Minister’s Forum in May 2016 and it was tabled in the Australian Senate in November 2016.
delivered in five yearly increments instead of yearly increments and with even less scrutiny than now. The 2016 review panel said the reason Biosecurity Queensland had failed to eradicate fire ants so far was because of insufficient funds and funding uncertainty. Previous reviewers recognised this familiar excuse and were more inclined to think the program was failing because of the incompetence of Biosecurity Queensland’s managers rather than funding issues. There is no doubt that Australia needs to eradicate fire ants if we can. Analyses done by the Australian Bureau of Agricultural Resource Economics and Sciences have shown the huge impact one of the world’s worst invasive species with have on Australia’s unique environment, economy and out-door lifestyle. I hope the Australian Agricultural Ministers’ Forum agrees to continue funding a fire ant eradication program. But I would argue that the Commonwealth and other States and Territories will be throwing good money after bad if Biosecurity Queensland continues to runs the fire ant program and if the Commonwealth fails to provide proper oversight of the program. Oversight of the program can be improved if all reports and reviews of this publicly funded program are made available to the public to scrutinise how money is being spent in the public interest. The 2016 review panel acknowledged ‘the generous contribution of …. all staff in the Biosecurity Control Centre (Brisbane)…(and) ‘the work of Daniel Spring ….. from the School of Biological Sciences at Monash University.’ As well they might. Reading the review’s report in the light of previous reviews of the program and program reports, it does indeed seem that Biosecurity Queensland managers and Daniel Spring, a researcher funded by Biosecurity Queensland, contributed generously to the panel’s findings. The 2016 science review panel strongly supports the current science program. The panel says thirteen previous reviews have shown that the fire ant program in south-east Queensland was ‘scientifically sound.’ This is not true. The independent scientific review panel of 2009 was ‘surprised by the fragmented nature of the science support provided to the program.’ They said ‘Many of the scientists are not working on contracted tasks with clear deliverables.’ They said ‘Remote-sensing research and development……seems far too ad hoc.’ They said, ‘In the first 5 years of the program there were 35 scientific studies initiated, yet there is little or no documentation of the results of these studies.’ The 2009 review panel said the science program needed to collect and analyse data to integrate the scientific research into the program, to engage with external scientists and to have the program’s science peer-reviewed. Ably supported by Biosecurity Queensland managers, the 2016 review panel, found that ‘that the failure to achieve eradication is not due to the science’ and described specialist staff as highly professional and taking an intelligent approach to the challenging task of eradicating fire ants. Consequently, the 2016 science review panel concluded that ‘The science program has contributed significantly to the successes to date and is needed to do so in the future.’ But 2016 science review panel’s report gives little evidence to support this claim. It is hard not to image Biosecurity Queensland managers striving to help the review panel in order to keep their jobs. Daniel Spring became involved in the fire ant program in 2008 when Biosecurity Queensland commissioned Monash University to develop a computer model to predict the spread of fire ants and the program’s chance of eradicating them. The Monash Model showed that eradication was not possible while fire ants were spreading faster than the program could detect them. The Monash group, who are not entomologists, recommended that Biosecurity Queensland commence trials of remote-sensing surveillance technology (helicopter mounted heat sensing cameras) to detect fire ant nests more quickly: something not used anywhere else in the world. By 2015, the remote-sensing surveillance technology was past its use-by date and had been phased out. It had cost millions, achieved little and fire ants had continued to spread. However, the 2016 science review panel finds that the eradication of fire ants is critically dependent on the use of remote-sensing surveillance technology. It is hard not image the influence of Spring on this recommendation. Fire ants now infest an area of over 400,000ha: an area the size of the Australian Capital Territory. It stretches from Redlands on Moreton Bay, through Brisbane, Gold Coast, Logan, Ipswich City Council areas and into the Lockyer Valley, Somerset and Scenic Rim Regional Areas. The infestation is more than ten times what it was in 2001 when fire ants were first detected in south-east Queensland. The main cause of fire ants spreading is human-assisted movement: businesses who deal in fire ant friendly materials like soil, mulch, and compost carelessly or accidentally moving fire ants. And residents accidentally or carelessly moving fire ant infested potted-plants. The fire ant experts from the USA who assessed the infestation in south-east Queensland in 2001 said the first thing the program needed to do was to stop people spreading them. They recommended an ‘aggressive containment’ program. The 2016 review panel acknowledges that ‘Compliance and movement controls are a crucial component of current and future programs…to address the problem of human-assisted movement…and noted the importance of ensuring that this is adequately resourced.’ The Agricultural Ministers’ Forum specifically asked the 2016 review panel to assess both a containment program and an eradication program as possible future options for the program. The 2016 review did not conduct a comparison cost-benefit analysis between a future containment program and a continuing eradication program, as required by its terms of reference. The 2016 review panel recommends only a scant fraction of the additional $380m it is asking for be spent on compliance and movement controls. The 2016 review panel expresses the hope that new legislation will make high risk enterprises more compliant with movement controls when 2002 legislation had failed to do so. The 2016 review’s lack of interest in the compliance element of the fire ant program could be because the program does not have a functioning compliance element: certainly not an ‘aggressive containment’ program. Since 2002, enterprises moving high-risk materials like soil and mulch (such as developers, landscapers etc) has been permitted to self-manage their risk of spreading fire ants. Many community minded enterprises have, but many have not. Biosecurity Queensland has no idea how many high-risk enterprises are operating in the Fire Ant Restricted Areas because there are only a handful of biosecurity inspectors left to identify high risk enterprises, to encourage them to adopt risk management plans and to audit those plans. In 2002 when fire ants infested about 40,000ha, there were 20 inspectors: now there are eleven to inspect an infestation that is more than 400,000ha. Biosecurity Queensland is relying on new legislation to make the public and high risk enterprises comply with movement controls. But with only one ever enterprise being prosecuted for moving fire ant friendly materials out of a Fire Ant Restricted Area, why would anyone take their biosecurity responsibility seriously? The 2016 review’s lack of interest in the compliance element could also be because Biosecurity Queensland has no science program associated with assessing the spread of fire ants via human-assisted movement. The reviewers note that ‘it is far less predictable than natural spread and more difficult to plan for’: though the highways leading west, north and south out from Brisbane might give a clue on how fire ants have been spreading through south-east Queensland. And Daniel Spring, wrote in ‘The Conversation’ in December 2016 that he questioned the importance of the role human assisted movement and, by implication, the importance of movement controls in eradicating fire ants: an astonishing statement! In 2008, Daniel Spring recommended that Biosecurity Queensland commence trials of remote-sensing surveillance technology (helicopter mounted heat sensing cameras) to detect fire ant nests quicker than they were spreading. The 2009 the scientific review team, led by Professor Rick Roush from the University of Melbourne, was far from confident that the technology would work. That 2009 panel noted that the idea of using remote-sensing technologies had been rejected in 2001 and again 2004 because it was likely the technology would identify too many things incorrectly as fire ants while missing actual nests. And because it could only be used during cooler months and on calm days, the 2009 science review team said there was a good chance that fire ants could still spread faster than the technology could detect them. But with Spring’s promise of the remote-sensing surveillance technology as the ‘silver-bullet’ that would save the fire ant eradication program, Biosecurity Queensland wasted millions of dollars and years to time trying to develop the technology. By the time the remote-sensing surveillance technology was phased out in 2015, the technology had found 38 nests, identified thousands of rocks and lumps of manure as fire ant nests and missed hundreds of nests that the public found. While Biosecurity Queensland trialled the remote sensing technology, the fire ant the infestation blew out from around 100,000ha to over 300,000ha. Spring explains the technology’s dismal result on the fact that it was only used to monitor the edge of the incursion where they hoped to find only a few nests. But with a hit-rate of only 38% and no reported ‘miss-rate’: likely to be at least 20% (Vogt 2008), it is hard to have any confidence in Biosecurity Queensland’s claim that there were only 38 nests to be found and the extent of the infestation had been delimited: particularly since fire ants have been already been detected beyond the bounds of the July 2016 Fire Ant Biosecurity Zones map. Nevertheless, the 2016 review panel, commissioned Spring and his colleague, modellers not economists, to determine the appropriate level of funding for any future ten-year fire ant program so that their findings would be consistent with the work they had previously done for Biosecurity Queensland. Spring and his colleague acknowledged that they could not actually model the program’s current approach to eradicating fire ants: which is exactly what the 2009 review team had said. The 2009 review panel had said that it was doubtful that modelling could predict the probability of eradication unless it was informed by empirical data from rigorous field trials on the efficacy of the treatment and surveillance regimes and the patterns of dispersal. That data does not exist. Spring notes, therefore, that he and his colleague could only give guidance, not an optimal approach. Spring and his colleague determined four future funding options for the program based on four scenarios: one without using remote-sensing surveillance technology and three with it. The scenarios consider the program’s treatment and surveillance efforts, only. They did not factor in the impact of increasing or decreasing rigorous movement controls. Without any empirical field data on the efficacy of the remote-sensing surveillance technology, the scenarios do not factor in the costs to the program of the remote-sensing surveillance technology continuing to miss at least 20% of immature nest (Vogt 2008). Scenario 1: The program does not resume the use of the remote sensing surveillance technology that was phased out in 2015. If the funders spend $30m pa on treatment and (other unspecified) surveillance methods, 50% of fire ants will be eradicated in 6 years and only 95% in 10 years. If the program spends only $24m pa on treatment and other (unspecified) surveillance methods, 50% of fire ants will be eradicated in 6.5 years and only 90% in ten years. Therefore, the reviewers say, it is not possible to eradicate fire ants without the use of the remote sensing surveillance technology. Scenario 2: That the program recommissions the current remote-sensing-surveillance technology with its current 38% ability to differentiate between fire ant nest and other warm things like rocks and manure, and it takes one year to recommission the technology. If the funders spend $30m pa, it will detect 50% of nests in 6 years and 100% in 10 years. If the program spends only $15m pa only 50% of fire ants will be detected in 8 years. Scenario 3: That the program recommissions the remote sensing surveillance technology, its sensitivity can be improved from 38% to 50%, and it takes one year to achieve that level of improvement. If the funders decide to spend $30m pa, 50% of fire ants will be eradicated in 6 years and 100% in ten years. If the program decides to spends only $24m pa, only 50% of fire ants would be eradicated in 8 years. Scenario 4: That the program decides to recommission the remote sensing surveillance technology, its sensitivity rate can be improved from 38% to 50%, but it takes two years to reach that level of improvement. If the program decides to spend $30m pa, 50% of fire ants will be eradicated in 6 years and 100% in ten years. If the program decides to spend only $15m pa, only 50% of fire ants will be eradicated in 8 years. Given that the remote sensing surveillance technology has only a 38% chance differentiating a fire ant nest from a cow pat, and an undisclosed chance of missing nests entirely, Spring advised that it would take ‘extensive investigation’ to improve the remote sensing surveillance technology: between 1-2 years, and it is unlikely to be fully operational before May 2018. The best funding recommendation that Spring and his colleague can come up with is $22-24m pa for 10 years which is basically the current funding rate, for another ten years on top of the fifteen years so far. It is hard not to imagine that $22-24m pa is not much more than a number pulled out of thin air and it is hard not to imagine that the drive to secure more research contracts influenced the modellers’ scenarios. Give us more money for more of the same ‘fragmented’ and ‘ad hoc’ science. The science review panel of 2009 had said that the fire ant eradication program science program was ‘fragmented’ and ‘ad hoc.’ In 2016, with the fire ant infestation four times the size it had been in 2009, the science review panel of 2016 said ‘The science program has contributed significantly to the successes to date and is needed to do so in the future.’ The panel said they believed that that it is still technically feasible to eradicate fire ants because the program has the necessary tools to do so, provided they are applied correctly. The major impediment, they said, is not the tools and techniques, but the uncertainty of funding. The 2016 science review panel’s evidence for supporting that claim is, I suggest, thin. Ably supported by Biosecurity Queensland managers, the panel claims that Biosecurity Queensland has contained fire ants within south-east Queensland, has eradicated two incursions and has developed significant technologies that will have application in other biosecurity programs: the remote-sensing surveillance technology, habitat modelling for targeting surveillance, effective baits, odour detection dogs, fire ant genetic analysis and an effective community engagement program. In 2015, Keith and Spring reported a 99.9% probability that the incursion had been contained within the boundary surveyed by the remote-sensing surveillance technology; based on the effectiveness of the remote sensing surveillance technology and the absence of reports from the public: neither being reliable measures. As fire ants continue to spread beyond the bounds of the 2015 Fire Ant Restricted Area maps, Biosecurity Queensland is in no position to claim that it has contained the spread of fire ants in south-east Queensland. To be able to declare a property fire ant free, the science review panel of 2004 said the fire ant program needed a protocol for validating such a claim: the protocol needed to include, ‘an analysis of the property’s history …invasions/re-invasion, treatment regime, survey history.’ The 2016 review panel notes that twelve years later, the program still does not have such a protocol because, as the 2009 review found, it has no empirical data from rigorous field trials of the efficacy of the treatment and surveillance regimes and the patterns of dispersal. The best the program can do is to declare a property fire ant free if no fire ants have been detected two years after the end of a treatment regime: but even this depends on knowing the property’s treatment and surveillance history. Biosecurity Queensland does not have and never has had a functioning data base containing this sort of data: despite this being one of the milestones prescribed by Ministerial Council in 2001. The 2002 science review panel said ‘the (program) is no position to know, with any degree of certainty, what areas have not been treated, what areas have been treated and what they were treated with’. In 2003, program auditors said ‘The scarcity of performance measures against outcomes prevents a more objective evaluation of operational efficiency.’ The 2004 science review panel said ‘It is not clear what properties have been surveyed and not treated or treated and not surveyed…. We would like clarification on these activities.’ The 2009 science review said ‘The review team was surprised by the lack of a consistent and coherent information base to assess the effectiveness of surveillance and treatment protocols. In 2012, a project team was commissioned to re-develop the data management system because ‘the current system is fragile. Its performance is erratic, subject to outages following major releases, its ability to provide basic functions is questionable.’ In 2015, a review of Queensland biosecurity capability found that Biosecurity Queensland still lacks an effective performance management information system with high quality, timely and well-understood performance information. Without an eradication protocol populated with validated surveillance and treatment data, Biosecurity Queensland is in no position to declare any area fire ant free. The 2016 science review of the program claims that Biosecurity Queensland has developed technologies that can have wider application in other biosecurity programs. The review provides no evidence of the success of these technologies, but recommends more funding for them, just the same. Remote-sensing surveillance technology: See above. Previous reviews have repeatedly asked Biosecurity Queensland to conduct field trial on the efficacy of using broadcast baits alone (without the additional use of direct nest injections), and field trials on the efficacy of direct nest injections. The 2004 science review said the best scientific advice was for 3-4 treatment for 3 years. However, Biosecurity Queensland managers have struggled to consistently apply three rounds of bait for three consecutive seasons. They have even resorted to applying water-soluble bait in the rain. Since 2002, reviewers have been asking for an evaluation of the use of direct nest injections. The 2004 reviewers said that nest injections are labour intensive, reasonably ineffective (some nests require three injections), the act of injecting insecticide can disturb the nest and cause it to split and the use of nest injections makes it impossible to assess the effectiveness of baits alone. The 2004 reviewers said the use of nest injections suggests that Biosecurity Queensland is not confident of its eradication strategy. As fire ants continue to spread and re-infest previously treated area, Biosecurity Queensland is in no position to claim that it has developed effective baits in the fire against fire ants. The best Biosecurity Queensland can do is to wish for water resistant baits and aerial baiting by drones. The 2016 science review panel noted the use of odour detection dogs to find fire ant nests has been have been an innovation and recommend that the program employs more of them. But, but as the 2009 reviewers said, the dogs’ capacity is limited to just several hectares a day and the 2016 review makes no recommendation on the strategic use of the dogs, given the extent of the whole infestation now. The 2016 reviewers note that the key science under pinning the program is the genetic analysis of fire ants. In 2011, Biosecurity Queensland was claiming that a decrease in the genetic diversity of the fire ant population in south-east Queensland, something not observed in other invaded countries, was a strong suggestion that the eradication was being effective. As fire ants continued to spread, this was a premature claim. Biosecurity Queensland now claims that genetic analysis is a valuable tool for determining the source of a new infestation: whether it was caused by natural spread or human-assisted movement: to provide evidence of breaches of movement controls. But given that it is difficult to determine the parentage of the polygyne form of fire ants that dominate the infestation in south east Queensland and given that any new infestation found >10km from the nearest infestation is likely to be the result of human-assisted movement, it might be wiser to invest in more biosecurity inspectors to under-take trace back analysis to determine the source of the infestation. And if the new legislation prohibiting the movement of fire ants was more rigorously applied, genetic evidence might be needed in relatively few cases. The program has benefited from significant public support from the very beginning and this continues. The 2016 science review panel notes that a community engagement survey found that 95% of people in Brisbane have an awareness of fire ants. Biosecurity Queensland regularly reports that 70% of detections have been made by the public. But the community engagement survey also found that only 56.2% of the public think that fire ants are still a problem. This is not surprising given that Biosecurity Queensland continues to tell the public that fire ants have been contained in south east Queensland and two incursions have been eradicated. If Biosecurity Queensland gives the public the false impression that fire ants are no longer a problem the public will stop being vigilant in their search for them. This is not the sort of community engagement program that others should emulate. The 2016 science review panel, well informed by Biosecurity Queensland managers and contracted researchers, found the greatest threat to the chances of eradicating fire ants in south east Queensland was insufficient funds and uncertainty about funding. The 2016 review panel said it was the lack of secure funding that prevents Biosecurity Queensland from engaging in long term planning in south east Queensland, forces the program to changes it priorities which leads to waste and increases the time it will take to eradicate fire ants. The review said it was the difference between funds requested and funds provided that prevents Biosecurity Queensland from maximising eradication benefits in south east Queensland. Blaming poor results on funding problems instead of incompetent management is a long-term strategy of Biosecurity Queensland. Previous reviews have not bought it: squarely laying the blame for a failed program on Biosecurity Queensland’s inability to deliver a competent program. By 2015, nothing had changed. The review of Queensland’s biosecurity capability in 2015 found that Biosecurity Queensland did not collect performance information and analyse it to evaluate the best uses of resources and to inform strategic decision making. Consequently, the review said, Biosecurity Queensland’s decision-making on the use of resources is conflicted and inconsistent which means that Biosecurity Queensland does not optimize the use of its resources. 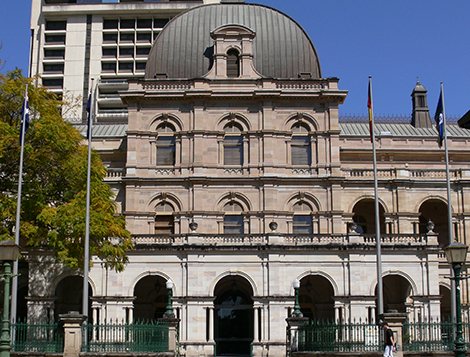 The Capability review did acknowledge that Biosecurity Queensland suffers from uncertainty about on-going funding: but mainly because Biosecurity Queensland lacks the ability to provide funding bodies with business cases for future funding: businesses cases based on a sound investment framework and performance management data, for funding biosecurity activities which are likely to produce the highest rate of return in managing risks to Queensland’s economy and environment and the Queensland community. Not only does Biosecurity Queensland want more money, they want it with less strings attached. Under the current cost-share agreement (50% from the Commonwealth and 50% from States and Territories) the program receives funding on an annual basis and the money comes with pre-determined rules about how it is spent and with auditing and reporting requirements. a ‘high level trigger’ specifically means when a new infestation is beyond Biosecurity Queensland’s own estimate of its capacity to deal with it. The essence of the panel’s recommendation, well informed by Biosecurity Queensland managers and contracted researchers, is for the Commonwealth, States and Territories to commit to the same amount of money again, with less strings attached, for the same old program that has seen fire ants go out of control. There is no doubt that Australia needs to eradicate fire ants. Fire ants are one of the world’s worst invasive species and a serious threat to Australia’s unique environment, economy and out-door lifestyle. I hope the Commonwealth, States and Territories continue to try to eradicate fire ants. But I would argue that program funders will be throwing good money after bad if Biosecurity Queensland continues to runs the fire ant eradication program. The reason why more than $400m of public money has been wasted, I suggest, is because of the Commonwealth Government has failed to provide proper oversight of how that money has been spent in the public good. The Agricultural Ministers’ Forum is briefed on the National Red Imported Fire Ant Eradication Program by the Tramp Ant Consultative Committee: a committee made up of technical experts from all the States and Territories. The role of the committee is to provide technical advice to the program and to the Minister’s Forum, to receive reports from the program and to judge when eradication is no longer technical feasible or cost effective. The Committee is chaired by the Chief Plant Protection Officer or other senior officer from the Commonwealth Department of Agriculture. All advice from the Committee to the Ministers’ Forum goes through the Chair. In 2013, Deloittes, the program auditors, made specific recommendations about the governance of the program: particularly about the functioning of the Tramp Ant Consultative Committee. Deloittes said that Consultative Committee had not established regular meeting times and representation on the committee was inconsistent (not all jurisdictions were represented at all meetings and jurisdictions sent different representatives to different meetings), Consultative Committee had not agreed on a long-term plan or targets for the program, had not established any performance indicators and had not specified what information it wished to receive. Having the basics of a functioning over-sight committee in place is the responsibility of the Chair of the Committee and clearly, they were not. Consequently, according to the auditors, until the first quarter of 2012-13 (at the auditors’ request) Consultative Committee had been prepared to accepted annual ‘narratives’ from Biosecurity Queensland about the program rather than analytical reports. Program reports did not explain why the program’s actual performance could vary between +8% and -21% from its plan, program reports did not contain any trend analyses so that auditors could compare and track progress; program reports that did not contain any robust return on investment analyses. The auditors repeated their concern from previous audits: the fire ant program lacks any mechanisms for validating field data. In sum, the auditors said that unless Consultative Committee received complete, clear and accurate information about the fire ant program it may not be able to provide appropriate oversight and the Committee ran the risk of making inappropriate decisions. The poor quality of the governance processes of the Tramp Ant Consultative Committee brings into question its ability to provide proper oversight of the fire ant program and close scrutiny of how $400m of public money has been used for the public good. And, I suggest, the poor quality of the governance processes also brings into question the quality of the advice the Chair of the Tramp Ant Consultative Committee was providing to the Agricultural Ministers’ Forum: advice that not necessarily aligned with the findings of independent reviews of the program. In June 2006, the third scientific review of the program reported ‘Fire ants are re-infesting properties that have been treated…. sixty new detections found beyond the treatment area…… (this is) a resurgence, not a mopping up phase….Fire ants are spreading faster than they are being found…. Start again with aerial baiting and aggressive containment. ’In November 2006, the Chair of Consultative Committee told Ministers’ Forum ‘that the program was making satisfactory progress and the Committee remained positive about the chances of eradication’ but reported that the review panel had said that the program was at a critical phase and it would be clear with the year of eradication can be achieved – with existing resources. The Tramp Ant Consultative Committee has failed to provide adequate oversight of the National Red Imported Fire Ant Eradication Program and must be held responsible for how $400m of public money has been spent, or indeed wasted. The 2016 scientific review panel of the fire ant program avoided any confusion between its findings and what Consultative Committee reports to the Ministers’ Forum by making the Committee’s decisions for it: that it is still technically feasible and cost beneficial to eradicate fire ants: decisions beyond the authority of the review panel and unsupported by sufficient evidence. The one recommendation that the 2016 science review makes that I agree with is for the Agricultural Ministers’ Forum to considers the establishment of a permanent governance body to oversight the fire ant program’s implementation. I would add, so long as that body is open public scrutiny. The report of the 2016 scientific review of the National Red Imported Fire Ant Eradication Program is the first report of the very many reviews of the program that has been made public. All fire ant program reports, review reports and minutes of Consultative Committee meetings are accessible under Right to Information processes: which are slow and expensive. All submissions to Ministers’ Forums and Forum decisions used to be publicly available, but are no longer. Commonwealth oversight of any future fire ant program will be improved, I suggest, if the public has access to all program reports and reviews to to scrutinise how public money is being spent in the public interest.